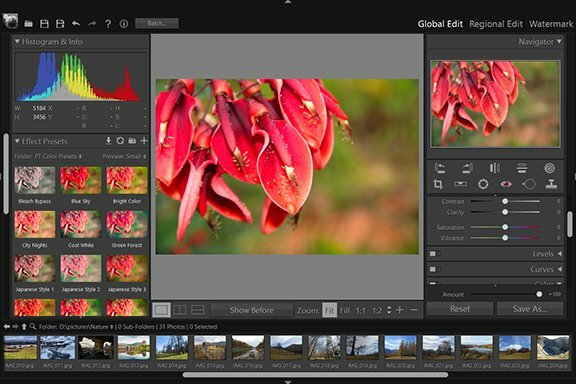 Color Adjustments - Global Edit - User Guide of PT Photo Editor - Easily rescue problem photos. Make every shot its best. 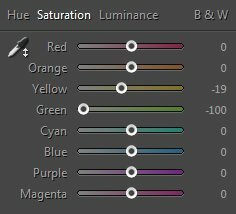 The Color adjustment panel allows you to affect individual colors in your image, and convert the color image to black-and-white. 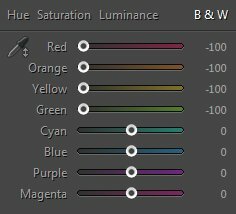 Select "Hue", "Saturation", or "Luminance" to display the sliders you want to work with. 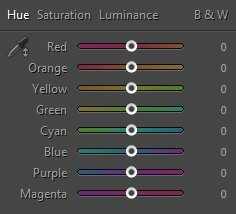 Hue: Changes the color. For example, you can change a blue sky (and all other blue objects) from cyan to purple. 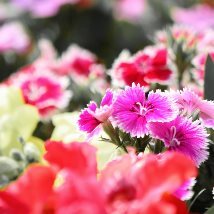 Saturation: Changes the color vividness or purity of the color. For instance, you can change a blue sky from gray to highly saturated blue. Luminance: Changes the brightness of the color range. To adjust a particular color, drag the slider of the color. 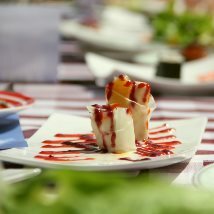 You can also use Color Eyedropper to click on a color area in the photo that you want to adjust, drag up or down to affect all similar colors in the photo. When select B&W, the color image will convert to black-and-white. Although there are no colors or saturation in black-and-white, you can still use sliders to affect the actual luminance levels of the colors. This allows you to create a more specific look of a black and white effect for your images. 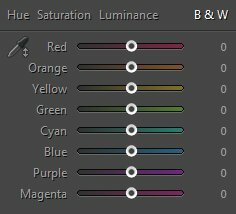 You can select Color Eyedropper , click and drag on a certain area in the photo to get the balance we need for our black-and-white mix.